The watch collection 2012 from Roamer moves once more in a particular area of tension between mechanical watches and precision quartz models. Simplicity and tasteful understatement dominate the overall impression of the collection. Especially classical forms are dedicated models like Stingray, Mercury and Limelight. R Powerchrono and provide superior contrast, sporting elements of the glamorous first. As a highlight of the chronograph is also still the trek master with an excellent multi-function program. Finally sets Roamer continued the growing trend for ceramic watches. Ceraline Saphira, Ceraline Bijoux and Ceramic Square enrich the 2012 collection with simple timepieces that seduce in white and black ceramic design visually and tactilely. 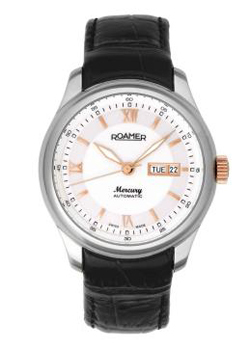 Mercury models are soon to become a classic and top-sellers of the Roamer advanced collection. They combine precision and quality workmanship. The very first look at the elegant design of the clock conveys the quality and comfort. For inducing the pleasant simplicity of bright color match dial and stainless steel elements creates a harmonious overall picture.